What if you had a little widget that predicted all your favorite online things, and preloaded your preferences automatically whenever you connected to WiFi? Meet PAUL, the free Android app from the team over at inmobly, that does just that. 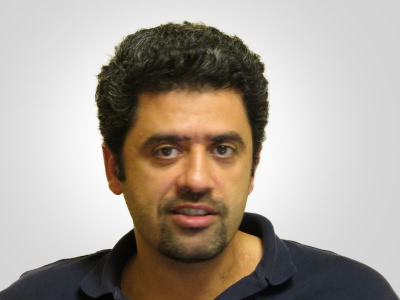 We caught up with president and co-founder, Dr. Hesham El Gamal who has recently secured $650,000 in seed funding for his predictive technology goodness. Oh yeah, and his back story is certainly interesting too. Check it. What inspired inmobly and the PAUL App? The idea behind PAUL technology was conceived as an invention by my research group at The Ohio State University. My research is in wireless technologies, focusing on security. The original idea was algorithms for using open WiFi networks securely. This developed into the foundational PAUL idea, of using WiFi to offload network traffic. inmobly was founded as attempt to take our theoretical research to practice – my research has resulted in patents before, but this was a new opportunity to take the idea to market. The challenge in itself was a big part of the motivation. As for the name PAUL, it is a tribute to PAUL the octopus who correctly predicted the outcome of the games of the German team in the 2010 soccer world cup. As you can see, the founders are hard-core soccer fans. It sounds like you have an interesting back-story with starting up in Egypt during the revolution. Can you tell us a more about that and your perspective on US/Middle East partnership potential? The experience has been challenging but immensely rewarding. Work-Life balance is difficult in a startup to begin with – adding in an additional component of working through a revolution and attending demonstrations takes it to a new level. It created a powerful bond for our company, but also demonstrated how important it was for us to have a more stable environment for work, for funding, etc. Our funding couldn’t rely on the Egyptian government at such an uncertain time. From founding, our intention was always to have this be a US company – the revolution made it clear that the move had to happen sooner not later. Having a presence in the Egypt and US allows for combining the best of the two worlds but one has to overcome the challenge of perception of high risk. Egypt offers a wealth of young talent and a very efficient cost structure. The US on the other hand allows for the ideal environments for startups in terms of knowledge, capital access, senior talent, potential for partnership, in addition to a mature legal and financial system. Best part is the ability to work with young talent and see them grow along the way. The most challenging part is making decisions while bearing the responsibility of not letting your team down. Peter Thiel. I recently went through his notes for the course he taught at Stanford and found the material very intriguing. I would chat about his experience as a founder and funder. As for the food, I will let him pick the restaurant and go with his recommendation. Well, I have to admit that it is taking a lot of my time. But, it is an amazing learning experience. Over time, I think I am learning how one can succeed by leading and inspiring other people. Over the last two years, we have developed a common sense of ownership for inmobly. We stay motivated by our commitment to have a great product. I would say overall, it is a very fun and energetic environment. We are a sarcastic group, and a humble group, and we are always ready for a laugh. Even on the tough days it is not so hard to come into work because we all like each other, and can make each other laugh. Be very picky in choosing your team. Can the KillerStartups community help you in any way? Where can our readers reach you? Reaching out to potential investors, partners, or startups who can share their experience will be highly appreciated. Thanks, Hesham! Now, go download PAUL the App (for free!) and make your WiFi-using life a little easier. I mean, how could you ever resist that cute little octopus face?